The BEST part? They gave me a free 1.2 oz sample of their Southwest Seasoning! Also a copy of their latest magazine/catalog, that had a number of yummy recipes. If you are in the market for refilling some of your spice containers... definitely check them out! I am very excited about our first venture into vegetable growing. Our only outdoor space is a small balcony, and last summer we had an abundance of herbs that did quite well out there. This year we decided to branch out and try some small vegetable growing. So, we got a small cherry tomato plant and a habanero pepper plant along with our regular herbs. I happened to notice today... we have tomatoes growing!! I am VERY excited by this as I really wasn't sure that we'd get any. I can't wait til they are ripe (and I hope a lot more come about). YAY! It's that time again! This round was hosted by Dani of Make No Little Meals and the 5 ingredients were mint, bok choy, mango, yogurt, and panko. First, I made Grilled Shrimp and Crab cakes, with Grilled Bok Choy and a Mango Dipping Sauce. I love crab cakes and this was a different and interesting way to have them! I discovered that I love bok choy, and how have a fridge stocked with it! Grilling it was pretty easy, but I found that the tops (green parts) of the leaves aren't terribly hearty when it comes to the grill. I didn't find that part enjoyable to eat. The mango sauce was originally way to strong on the ginger, so I've paired it down for the posted recipe. Overall, they tasted great! The dessert was a little harder to create. I started with a mint chocolate chip frozen yogurt recipe that called for spinach. I thought it was cute and gave it a shot...... but ultimately it was too spinach-y for me and I didn't care for it. I tried again without the spinach, but still didn't love it. So it was back to the drawing board. I decided to try and lighten up the Gooey Chocolate Cakes I made with the TWD crew, and found success (almost). I replaced butter with yogurt and achieved a wonderfully dense, moist cake, but there was not enough mint and it was lost in the final product. I increased it in the recipe listed below, but next time I'll probably just use peppermint extract to make sure it is strong enough (but such was off-limits for this challenge). Combine all ingredients in a large bowl, mixing just until everything is incorporated. Form into patties or small balls (as I did since I wanted to grill them in my cages) and roll in additional panko. Chill in the refrigerator for 30 minutes to set. Grill over medium heat for a few minutes on each side. Add garlic and ginger to evoo, allow to blend for upwards of 30 min to an hour. Brush cut sides of bok choy with the blended evoo. Place cut side down on grill over medium low heat for a few minutes (they don't need much). Combine all ingredients except garnish in a blender or food processor, pulse to combine. Pour into dipping bowl and garnish with lime zest. Center a rack in the oven and preheat the oven to 400 degrees F. Butter (or spray – it’s easier) 6 cups of a regular-size muffin pan, preferably a disposable aluminum foil pan, dust the insides with flour and tap out the excess. (I use 3 - 7 ounce ramekins sprayed with baking spray). Put the muffin pan on a baking sheet. Sift the flour, cocoa and salt together. Steep the cream and mint leaves together for a few minutes, being careful not to scalb/boil the cream. 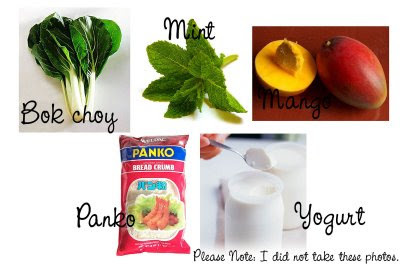 Combine with yogurt in a small processor or blend and pulse to combine. Set a heatproof bowl over a saucepan of gently simmering water, put the chopped chocolate and the yogurt mixture in the bowl and stir occasionally over the simmering water just until they are melted. Remove the bowl from the pan of water. Transfer them, still on the baking sheet, to a rack to cool for 3 minutes. (There is no way to test that these cakes are properly baked, because the inside remains liquid.) 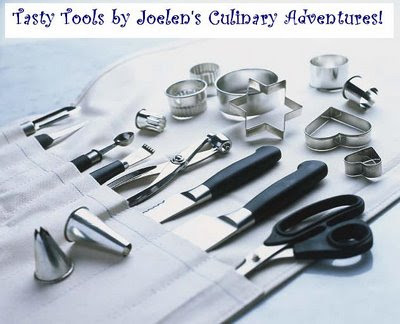 Line a cutting board with a silicone baking mat or parchment or wax paper, and, after the 3-minute rest, unmold the cakes onto the board. Use a wide metal spatula to lift the cakes onto dessert plates. 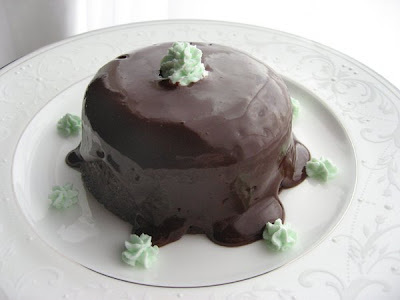 I then poured a little leftover warmed chocolate ganache over the top, and garnished with some mint whipped cream. I was very excited to hear about a new blogging event, Barefoot Bloggers. This particular group seeks to prepare recipes from the wonderful Ina Garten (of Barefoot Contessa), twice a month. I'm certainly doing my share of baking around these parts, so an event to incorporate some cooking challenges seemed like a great thing. The inaugural recipe is Herbed Baked Eggs. I was really excited about this as my husband loves eggs, and it just sounded so good! I followed the recipe, baked them up, took them out, made some toast, started snapping some pictures... then we finally settled down to eat. One touch of the spoon to the eggs and I knew we had a problem. These were *definitely* not cooked! I ended up popping them back in for another 5 minutes, which finally cooked the whites... AND the yolks. :-( I chalk it up to the bowls not being large enough for them to really spread out and cook quickly and thoroughly. The fact that I was using a toaster oven to broil *may* also have something to do with it. :-) Once they were properly cooked, we completely enjoyed our wonderfully flavorful bowls of herbed baked eggs. I certainly see more of these eggs in our future! Herbed Baked Eggs, from Barefoot in Paris. This was a LOT easier than I thought it was going to be! I was a little nervous about making the brioche loaf, but I, uh, let the stand mixer do all the hard work. :-) Overall, the worst part about these was waiting so long to get to taste them! They were very yummy, and disappeared quite quickly at work, but in the future I might reduce the amount of honey because I found it to be too much. ~3 sticks (12 ounces) unsalted butter, at room temperature but still slightly firm. This is a spin on the Old Time Vanilla Ice Cream, and is from the same website. It is, perhaps, not as peanutty as I'd like, but it is still OH so delicious and my husband absolutely loves it! Here I topped it with some caramelized peanuts leftover from Snickery Squares - yum! Having made this recipe so many times, I've worked how to lower the fat content a bit. The resulting ice cream is still SO creamy and wonderful that you'd NEVER know you were missing anything! ~In a large mixing bowl whisk together egg and sweetened condensed milk. Add sugar, brown sugar and peanut butter, mix thoroughly. Then add heavy cream, milk, half and half, salt and vanilla extract. ~For the very best results (who wants anything less? ), let the mix chill in the refrigerator for about four hours which allows the mix to "age" before freezing according to the directions with your ice cream freezer. In the last 5 minutes of mixing, add the chocolate chips. This was pretty easy to throw together and grill. Light, refreshing, and versatile - we've also used it for chicken fajitas with grilled red onion/zucchini and some slice avocado (if you go that route - reserve a bit of the marinade before pouring it over the chicken... just before assembling fajitas, toss all your fajita mix ins with the marinade). 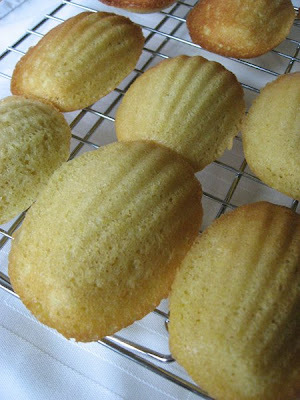 I had always secretly wondered what the story was with these "madeleines." Why the special pan? What are they, really? What do they taste like? 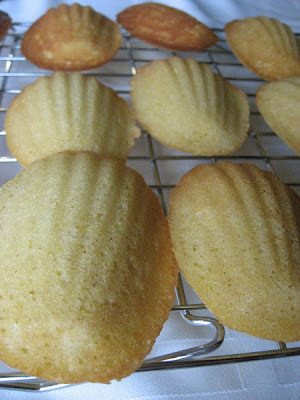 I finally got my answer... wonderful, yummy, little pillows of lemony spongey cakey joy! (I still don't know what's up with the funky pan, though). There really isn't much else to be said! I forgot to take a picture of these lovelies before packing them up for work, so all I have is a picture of them cooling (note the delinquents in back who spent a little too much time in the "sun"). Check out the other TWD bakers here. This has a wonderful flavor to it... not overly strawberry and not overly mango - a perfect blend! I did have the typical homemade frozen yogurt issue of it basically solidifying in the freezer instead of ripening to a nice creamy dessert, and I may play around with greek yogurt for the next batch, or drain the regular yogurt for a while before using it. Either way, it is a cool yummy treat perfect for the... almost summer days! 1. Slice the strawberries into small pieces. Toss in a bowl with the sugar and vodka or kirsch (if using) until the sugar begins to dissolve. Cover with plastic wrap and let stand at room temperature for 2 hours, stirring every so often. 2. Transfer the strawberries and their juice to a blender or food processor. Add the yogurt and mango. Pulse the machine until the mixture is almost smooth. If you wish, press mixture through a mesh strainer to remove any seeds. 3. Chill for 1 hour, then freeze in your ice cream maker according to the manufacturer's instructions. I was quite inspired by the latest round of Platinum Chef Challenge (#7) and had a few recipes in mind to try out. The first recipe (Crab cakes) turned out great, but I still wanted to try my back up recipe (shrimp pizza) because I'd really taken the time to plan it out and it sounded so good in my head. I was chatting about my dinner plans with the ladies from What's Cookin, and Elly asked if my pizza was for the Beautiful Bones blogging event. I had never even heard of it, but as I looked into it, I realized this recipe is perfect! 2. Spray pizza dough with extra-virgin olive oil and place on the grill. As the dough cooks, it will firm up. Flip when it is firm enough. Meanwhile, place the panko in a shallow bowl or plate. Dip shrimp in mango sauce, then coat with panko. Grill shrimp, 2 to 3 min on each side. 3. When dough is ready and shrimp are done, remove dough for addition of toppings (or, if you are more talented than I, do so right on the grill!) Add the reserved mango sauce, about 1/2 the mozzarella cheese, then top with the tofu, bok choy, shrimp, goat cheese, then finish with remaining mozzarella cheese. Heat unil dough is finished and mozzarella cheese is melted. Slice and enjoy! Holy heavens! This is one rich dessert! I made the mistake (blessing?) of calculating the nutritional information, and decided to skip the ganache topping since it would just be hubby and I eating it (he can handle the calories, I can't!). I left him 1/4 of this in the fridge, as I'll be away for business for a few days - I really hope it's gone when I come back! The rest is sliced and in the freezer... and will definitely be a once-slice-per(overthe)-week treat. Definitely rich and definitely decadent! Problems (because I always have them): Definitely my first time working with this type of crust. I read some comments indicating it may take more than 24 oreos, so I added a few extra but didn't increase the butter (oops). I had a little difficulty getting it to stay up. I also try to get it unmolded without blow drying it... and some of it stuck to the pan. A lot of it crumbled off the sides when I tried to cut it, as well. I'm not really complaining because it cut a *few* calories off, but certainly something to make note of if I ever wanted to serve this to guests. Put the Oreo crumbs, melted butter and salt in another small bowl and stir with a fork just until crumbs are moistened. Press the crumbs evenly over the bottom and up the sides of the spring form pan (they should go up about 2 inches on the sides). Freeze the crust for 10 minutes. Bake the crust for 10 minutes, then transfer it to a rack and let it cool completely before filling. Using a large rubber spatula, gently stir in about one quarter of the whipped cream, just to lighten the mousse. Still working with the spatula, stir in the crunchy peanut mixture, then gingerly fold in the remaining whipped cream. Scrape the mouse into the crust, mounding and smoothing the top. 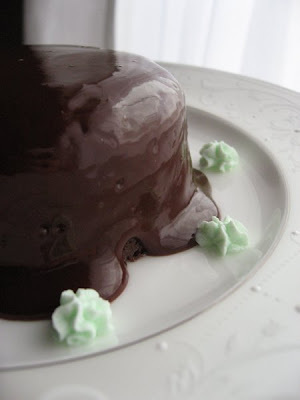 Refrigerate for at least 4 hours, or overnight; cover with plastic wrap as soon as the mousse firms. 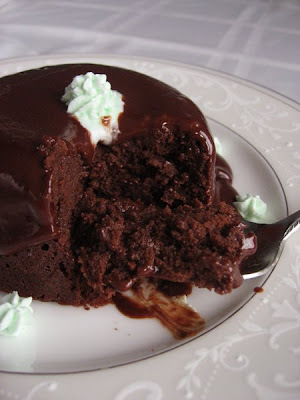 To Finish The Torte: put the chopped chocolate in a heatproof bowl and set the bowl over a saucepan of simmering water. Leave the bowl over the water just until the chocolate softens and starts to melt, about 3 minutes; remove the bowl from the saucepan. Bring the remaining ½ cup cream to a full boil. Pour the cream over the chocolate and , working with a a rubber spatula, very gently stir together until the ganache is completely blended and glossy.